River Warrior shows a rainbow trout preparing to take a Royal Wulff drifting on the water. The sparkling water and underwater rocks in this painting set the scene perfectly as the rainbow hovers in crystal clear water. The illusion is of actually wading in the river trying to catch this great fish. One can almost feel the current against one’s ankles when looking at the painting. This painting is acrlic on canvas and measures 40″ wide by 30″ high and has been sold. The Long Cast is one of Bern’s most popular paintings. A small gem, the original acrylic painting measures 20 inches wide by 13 inches high. The long loop of the fly line and the glorious colors of fall on the river create a special magic in this image. We are instantly in that place when we look at the painting. Although the painting sold immediately, giclee prints are available on this site. 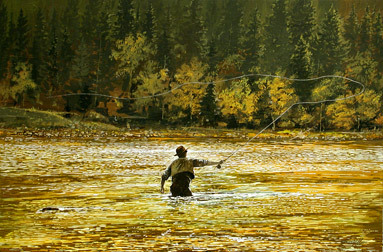 Bern Sundell”s giclee print of The Long Cast shows the magical moment of casting a long graceful line across a river sparkling with fall colors. 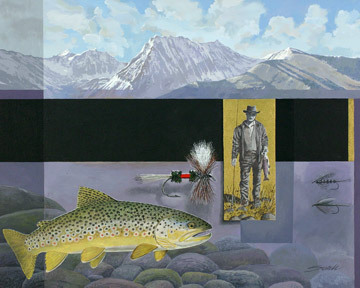 Bern Sundell”s giclee print of Purple Haze shows the memories and dreams of fishing with flies, trout, and a flyfisher in the composition. 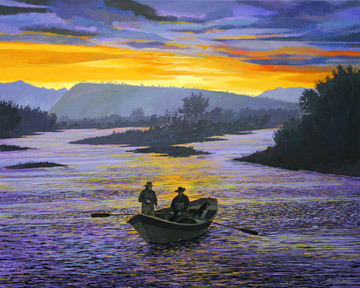 Purple Haze shows the memories and dreams of fishing past and present. Against a backdrop of snow covered mountains, a gold rectangle floats, bearing a fisherman from the days when one kept the catch. A couple of old traditional wet flies are softly rendered on the right. 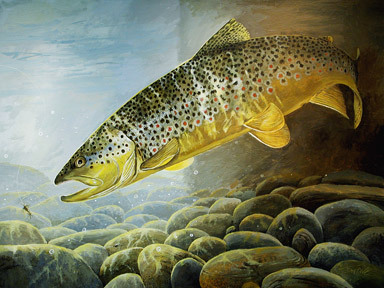 The bottom of the painting implies an underwater scene and a colorful brown trout floats in space. The geometric forms and their shadows create layers of space in the painting, powerfully accented by the dramatic full color Royal Wulff in the center. This jewel of a painting is 30″ wide by 24″ high and has been sold. However, giclee prints can be ordered. 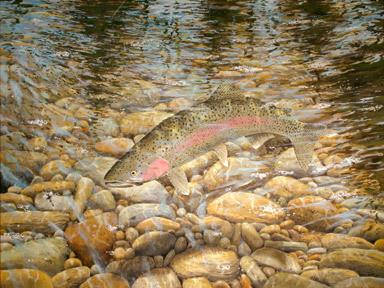 Bern Sundell”s giclee print of Rising Brookie shows the colorful beauty of this trout under water. 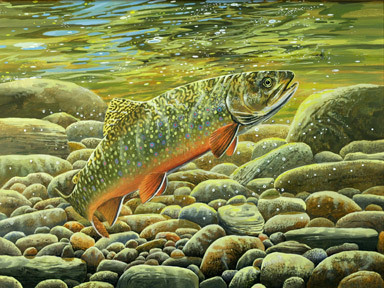 Bern Sundell”s giclee print of Varney Bridge Brown is an appealing image of a huge brown trout at the Varney Bridge on the famed Madison River in Montana. Bern Sundell”s giclee print of Moment of Magic shows the sunset as a driftboat with tired happy fishermen arriving at their takeout. 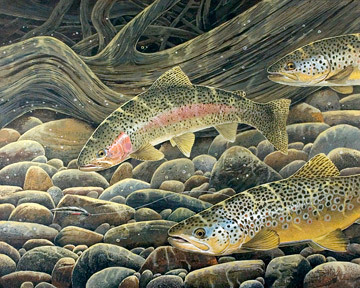 Bern Sundell”s giclee print of West Water shows underwater trout, a rainbow and two browns, eyeing a fly. 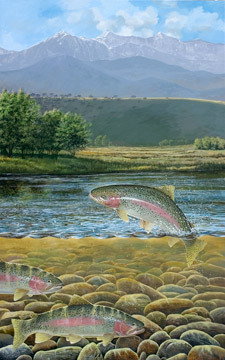 Bern Sundell”s giclee print of Backyard Trout is from a large original painting of rainbow trout leaping with mountains and an underwater scene included.